The Native Fish Report Card Program was officially launched by Minister for Water, Lisa Neville and Minister for Agriculture, Jaala Pulford on 5 October 2018. The program, a projected three-year collaboration between the Department of Environment, Land, Water and Planning (DELWP), the Victorian Fisheries Authority (VFA) and CeRDI, will keep anglers and communities informed on the results of scientific fish surveys. CeRDI Research Fellow Dr Birgita Hansen and CeRDI systems analysts, programmers and web developers provided technical and subject expertise in consulting, designing and implementing the interactive portal. 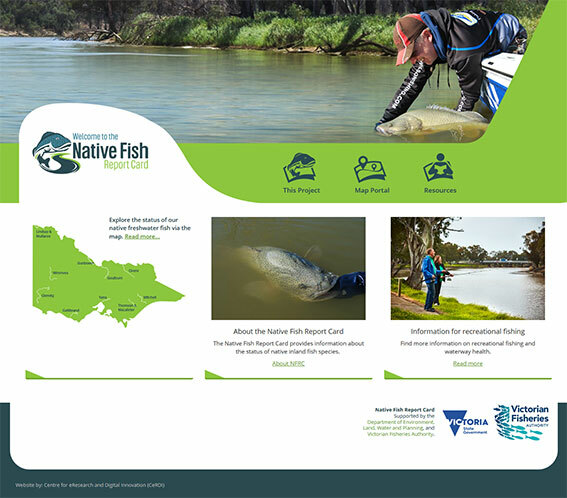 By accessing the Native Fish Report Card Portal users will be able to view report cards on recreational and non-recreational native freshwater fish in Victoria. The cards provide an overview of the health of targeted species and encourage informed and responsible fishing choices for anglers. One objective of the website and user portal is to contribute to fisheries management through annual addition of comprehensive monitoring data to the site, enabling improved assessment and evaluation of species health and management strategies. Ms Pulford, Minister for Agriculture, commented on the program’s capacity to provide insights directly measurable against government interventions on fish stocking. We can’t wait to see the benefits of our record native fish stocking and continued investment in snags for fish reflected in future report card results. The Portal focusses on 10 priority rivers across Victoria that were selected in consultation with Catchment Management Authorities, scientists and expert recreational fishers.